Here you will find all the information you need to plan and make the most of your holiday here, whether that is a mountain bike specific holiday or just cramming a day or two of mountain biking into your family holiday. Based in the south of Tenerife we operate our guided rides from mid September through to late June each year, closing only for the hottest months of July and August each year when often it is just too hot to ride and there are also often closures to the forested areas due to the high fire risk posed by the high temperatures. Here at Lavatrax we stick to what we know best, the riding, so we don't manage or operate any holiday accommodation ourselves. We can offer you a package of 5 days guided and uplifted riding for only 225€ per person, that's a price we have managed to maintain since 2011 to ensure that you get the best deal out there. That means that you're then free to choose the type of accommodation to suit your budget and your families needs. Just take a look at our PICK UP ZONE to see the areas that we cover with our daily pick up service for the rides. We also realise that not everyone enjoys the luxury of being able to take a dedicated Mountain Bike Holiday, so we still offer the opportunity for riders to enjoy a day or two riding our incredible trails as part of their family beach hoilday. We have a small fleet of top quality hire bikes, all full suspension to make this option as easy as possible. Just take a look at our itinerary and book as few or as many days as you would like. What type of mountain bike trails do we have in Tenerife and why should I go mountain biking in Tenerife? Tenerife is a relatively undiscovered gem for mountain bikers. The many trails offer a real feeling of wilderness mountain biking in a foreign land whilst being only a short flight (around 4 hours) from most of europe. The trails on offer are a real mix with relatively easy jeep tracks suitable for new riders into ultra technical rocky single tracks for the enduro experts out there. What we don't have are rolling hills, flat trails and meadows, so if you don't like a bit of a climb or a long descent then Tenerife possibly isn't the mountain biking destination for you. But if you long for challenging 30 kilometre descents then what are you waiting for! 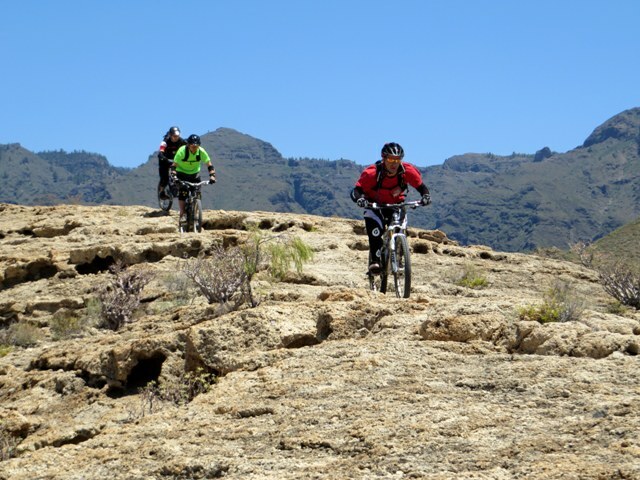 Mountain biking in Tenerife will almost definately see you returning to your regular home trails as a better rider, with challenges on the trails which can help to improve your riding and confidence. We have separated our rides into two distinct styles to help you choose the right package for your riding style and ability, with the longer and less technically demanding rides being found under the banner of XC or Cross Country and the more technically demanding rides being found under our Enduro heading. Our weekly schedule is usually made up of Enduro rides, but please ask if you'd prefer XC and we will do our best to accommodate you. So whatever you are looking for, from a single days guided mountain biking to a full weeks guided and supported riding, please feel free to contact us for more details. While you are here, why not take a look at our guest book and see the feedback from our many satisfied customers. We look forward to showing you around this island of contrasts very soon! Mountain Biking in Tenerife really is the haven from the cold, rain and mud that you have been looking for! Lavatrax Tenerife is now a test centre for Kingdom Bike, offering you the chance to try out their Hex All Mountain / Enduro superbike. Kingdom Bike want you to be able to try their headline grabbing Titanium machine in a challenging environment and so have selected us as one of their first test centres. So why not try the Hex on your visit to Tenerife with Lavatrax. We believe that you will love the Hex so much that we will give you a voucher for 100€ off the price of the bike should you choose to buy one following your test. Don't forget to make sure that your travel insurance covers you for Mountain Biking holiday in Tenerife. Most standard travel insurance policies will not include cover for this activity. Proof of valid insurance is mandatory for all our rides. It is also essential to bring your EHIC card. We recommend that riders carry a copy of their insurance documents, copy of EHIC and copy of their passport with them on all rides. It saves time in the unfortunate event that you need to call on them! Sportscover Direct offer full travel insurance which covers your chosen sport, or to complement your existing travel insurance, select an Activity Topup Policy which costs as little as £7.15 per day, why not check the link and get a quote today.